I can never understand why beauty departments have such awful lighting?! I guess it's all part of the illusion. 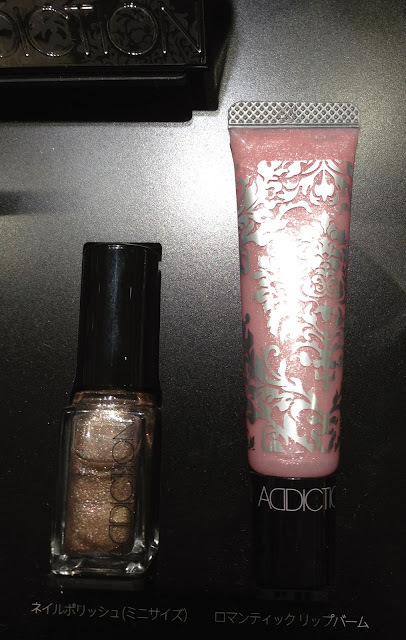 I love the gorgeous, shimmery, deep taupe-bronze nail polish, but I can do without the soft, baby-pink with silver shimmers lip balm. The set also includes a 15ml size Tinted Skin Protector. 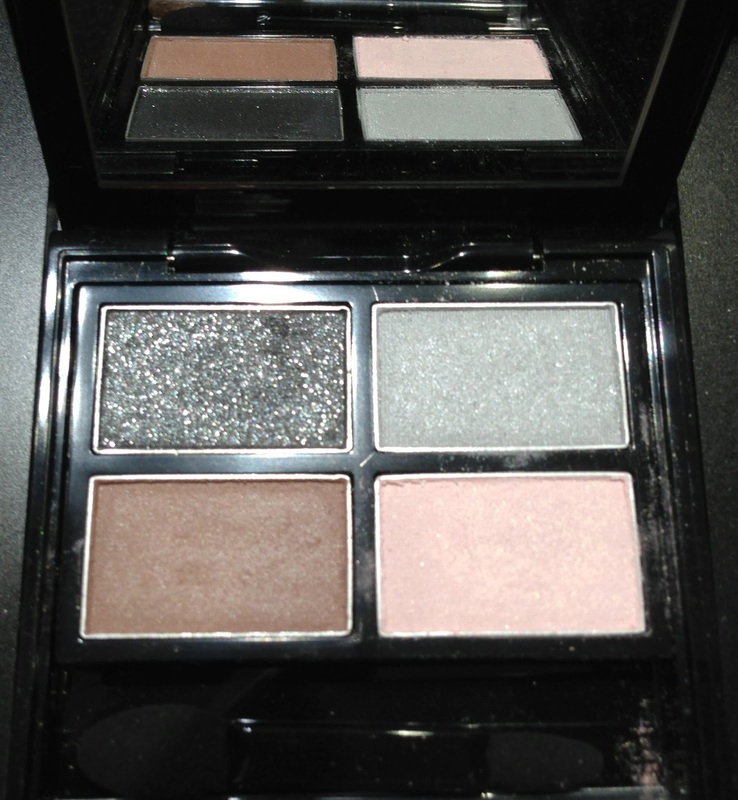 And here it is, the crux of my indecisive dilemma...the eye palette. 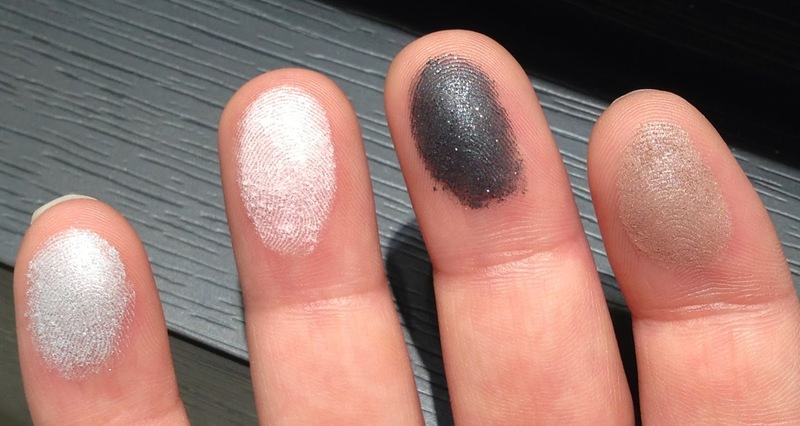 The eyeshadow shades are as follows: a pale, slivery-blue with silver shimmers; a pale, white-base pink; a sooty, charcoal black with silver shimmers; and a neutral, wheat brown. All four shadows have a satin finish, with the silvery-blue and pink shades being slightly drier in consistency. I feel in love with the wheat brown shadow, and, to be frank, I was underwhelmed by the other three eyeshadows. I don't think one eye shadow and a nail polish (not full size), justifies purchasing the Romantic Mind set, which retails for ¥7,980 ($83.82). What do I do?! What Holiday collection are you thinking of investing in? You'd think the beauty department would have better lighting, but no, it's either too yellow or washes you out. I'm only getting the THREE holiday coffret this year. Very! So far, I'm getting THREE's and both of Suqqu's coffrets. Yeah, but the packaging can only go so far. Even before I read your comment I was drooling at that wheat shade -- and you know I'm not into browns! Texture looks divine. Lol, I'm all for the illusion doll ;) I just want better lighting so I don't walk out with an ill matched concealer or foundation. That wheat shade is heavenly! Shame that the other three shadows are below par (in comparison). That's an awful lot of "extras" to get one shade, eh? Yep! Totally NOT impressed at all by the palette. The wheat brown shade only doesnt justify the price. I might give it some thought for half the price. 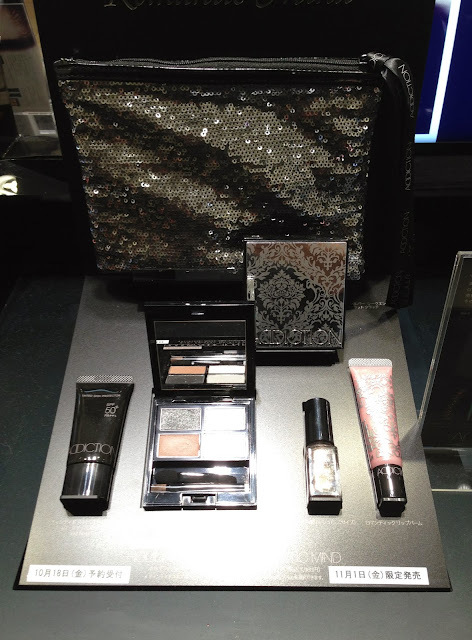 The only Xmas coffret that triggers my lemming is the SUQQU, esp the B coffret. And maybe RMK too. But still waiting for more swatches to come. And I saw the Cosme Decorte also, which is much better than Addiction. I know, I can't justify purchasing this coffret for one eye shadow and a polish. I'm in love with both Suqqu's coffrets, especially B. I need to swing by the Cosme Decorte counter, and get a peek at their Holiday set. Thanks so much for the swatches! I was really excited after seeing the promo pics too, but was worried the eyeshadow palette and lip gloss would be too silvery and cool toned. And they really are! Ordered the suquu kit b instead! Thanks once again! I need this palette, right now!!!! Can you help me get one....??? PLEEEAAASE??? ?